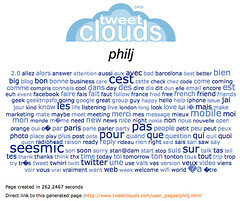 I had fun testing tweetclouds that gives you a tag with all updates you made on Twitter. Real geek stuff indeed! “Make a word cloud from a public Twitter stream”. Well, first remark, Loïc will be happy. Now I know why many people mention Seesmic when they talk to me. Did not realize this. Or (surely) really point out how French is a language with many words but poor meanings. Possible indeed. Never forget to care about your updates on Twitter. Always.